Wearable technology is routinely mocked by the fashion world, and you can totally see why - people keep inventing things like cooling underwear, drumming trousers and QR-code ties. But MIT's Media Lab reckons that a fingernail-mounted trackpad that it's invented might actually prove both useful and stylish. 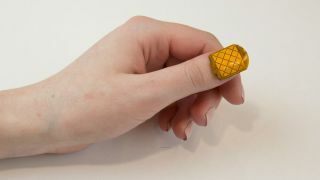 It's called NailO, and consists of a capacitive touch surface, microcontroller, battery, and Bluetooth chip crammed into a package that's small and light enough to wear on your thumb. "It's very unobtrusive," insists Cindy Hsin-Liu Kao, MIT graduate student and lead author on a paper describing the system, in an interview with Cnet. "When I put this on, it becomes part of my body." Kao has identified several situations where it might prove useful - when you're cooking and need to scroll a recipe down but both hands are busy, for example, or maybe at a formal dinner when pulling out a phone might be considered impolite or inappropriate. The tiny capacitive surface is surprisingly capable in terms of gesture recognition. The team tested it with five different gestures, obtaining more than 92% accuracy, though the researchers warned that accidental activation is a risk with an object that would be so prominently worn. Unlike many wearable tech devices, it's also designed to be attractive. The wearer can customise it with a nail art layer to match whatever you're wearing. "NailO blends into and decorates one's body when attached, yet remains removable at the wearer's discretion," the team writes on its website, "giving the wearer power and control over the level of intimacy of the device to one's body." Kao and her colleagues have met with battery manufacturers in China to try to further miniaturise the device, but are looking at a timeframe of about three years before NailO could become commercially available. So in the meantime, if you want to express your technological lust through your fingernails, you'll have to make do with a graphene nail coating stylus instead.